Adds a new area called Toucan Village. It is accessible using the bus. There are some buildings, i.e. Joja Mart. [ALL] Village 1.0.3 - Adds music to the village - Summer Tropicala (my personal favourite). [BL] Village 1.0.1 - Fixes an issue when warping to the village using the Bus Line, you cannot leave the bus. Get to the Village without the Bus? If you don't have the bus unlocked, there is another way to get to the village. 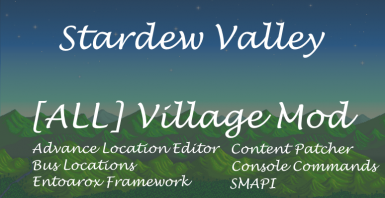 Simply download the optional file 'VillageConsoleCommands'. When you load up SMAPI and your save file, type village_warp into the console, and you will be warped to the village. 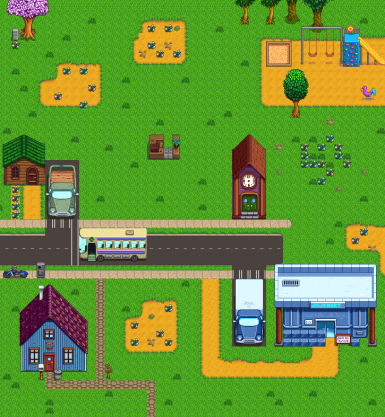 To get back to Pelican Town, interact with the Bus Ticket Machine near the bus. If you encounter any issues with this mod, please feel free to leave a bug report, and I will try to get to you as soon as possible. If you have any ideas with could be implemented into the Village, feel free to leave them in the comment section. I am always open for ways to improve my mods!